which pic of lucy do anda like the best? Who do u think lucy should be with? Does anyone know if Natsu and Lucy will ever kiss? If so, when? How much is Lucy's rent each month? Do anda think Gray and Lucy would make a great couple? 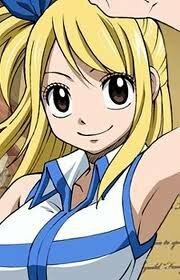 With the Oración Seis defeated, Lucy then heads back to Fairy Tail with her companions and Wendy. She is as equally shocked as Wendy when a loud loceng in magnolia chimes, and it is revealed that Gildarts has returned. Lucy tells Wendy a little bit about him, saying that Gildarts is supposedly the most powerful mage in Fairy Tail and that she had never seen him before. Edo-Lucy is just the opposite of the earth-land Lucy.unlike the soft and sweet Lucy we know Edo-Lucy is lebih like rough and tough and also bullies natsu. Crux knows all kinds of information about all celestrial spirits and their masters of the past atau present.When he is searching the information he sleeps which confuses other people. She is like a mermaid and carries a water jug and she is hard to control.She washes Lucy and her opponent. Taurus uses a two-bladed axe to attack and he is lebih interested in Lucy's body.He is kinda like a pervert too. Cancer has two scossors on each hand which he uses to attack and for hair-cuts.He says "ebi"(shrimp) at the end of a sentence. a comment was made to the poll: Who do u think lucy should be with? a comment was made to the poll: which pic is cuter? Did Lucy fell at Bora's spell? Which of her outfits do anda like best? whichone of lucy's spirits do anda like and why?